The Cherohala Skyway’s 36-miles of scenic mountain views rival any scenic byway in the eastern United States. Mountaintops, waterfalls and waterways joined together with wildlife and giant trees, adorn this high country of eastern Tennessee and western North Carolina. The average trip over the Skyway takes 2 1/2-hours, if you just want to drive and view scenery. I would recommend setting aside the best part of the day to enjoy some of the bigger than life features the Cherohala Skyway and Unicoi Mountain Wilderness have to offer. You can access the Cherohala Skyway from either Tennessee or North Carolina; this featured edition of the Scenic Highlander Tours begins in Tellico Plains, Monroe County Tennessee. Before leaving Tellico Plains, visit the local Cherohala Skyway Visitor’s Center on TN 165, a good way to prepare for your journey on one of America’s newest Scenic Byways. Though the official Skyway is 36-miles long the distance between Tellico Plains in Monroe County, Tennessee and Robbinsville in Graham County, North Carolina is about 50-miles. To reach the western gateway to the Cherohala Skyway, take TN 165 east from Tellico Plains, for approximately 6-miles, signs will mark the way. Right from the start of the tour you’ll find picture post card views along TN 165. The scenic drive follows the Tellico River as it winds its broad white-capped waters through the western foothills, entering the Unicoi Mountain Wilderness. This region along the eastern valley edge of Tennessee’s mountain country has shown signs of man’s local existence dating back 12,000 years. The river’s broad waters are ideal for fly-fishing. It’s often-shallow current is not as ideal for commercial rafting as the Ocoee River’s whitewater. River runners commonly bring their own rafts, kayak and canoes to the Tellico River. When the water level is up, the Tellico River can offer Class III, IV and V rapids. The more adventurous Kayakers would probably prefer the deeper white waters of the Upper Tellico River Gorge. The narrow waterway in the gorge has cascading waterfalls and deeper pockets. After following the Tellico River from Tellico Plains for roughly 6 miles, you’ll come to where TN 165 leaves the Tellico River behind and starts its official ascent along the Cherohala Skyway. For an interesting side trip before taking to the Skyway, turn right off of TN 165 and onto Forestry Road 210 (FR 210,) the route continues to follow the river into the upper gorge along a narrow-paved road, this is a definite “make time for” side trip. The Tellico River’s broad river bed narrows considerable at this point where FR 210 accesses the gorge. This part of the scenic drive travels deep into the mountain interior and is as spectacular in its own right as the great mountain vistas you’ll encounter along the Skyway. The narrow-paved road skirts along the edge of the upper Tellico River through the gorge. It then follows a path carved by time and nature, with sheer rock canyon like walls climbing upward and out of sight. The white waters of the river cascade over low waterfalls as rod and reel lines are cast across the river’s current. 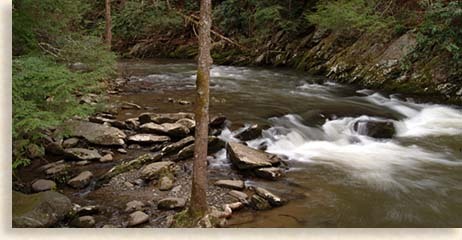 The Tellico River is famous for its trout fishing, one of the reasons for its popularity is the State operated trout hatchery located further up the river gorge. 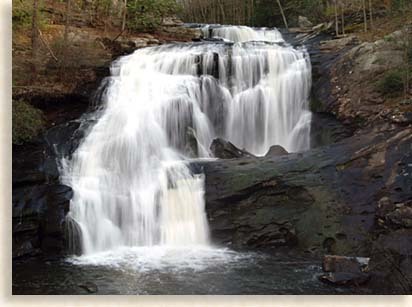 A few miles into the river gorge is the big payoff for this side trip, Bald River Falls. The falls are broad and drop about 90 to 100-feet into a pool below; the best part is this location is you can view Bald River Falls from the bridge that crosses over the river without leaving your vehicle. Past the bridge is a parking area if you’re interested in setting up a tripod for photos or just want to stand and gaze at the waterfall, it is definitely worth the time. A trail at the parking area leads to the top of the waterfall where you can watch the rushing waters of Bald River pour over the falls joining the Tellico River below. Always be cautious around waterfalls, slippery stones and inexperienced climbing around large boulders can lead to serious falls. The large rocks below and strong under currents at the bottom of waterfalls can be unforgiving and very dangerous. Past Bald River Falls along the upper Tellico River there are several more impressive waterfalls, these are lower falls, yet very dramatic looking. Beyond here is the State operated fish hatchery and campgrounds. After this short side excursion, return back down FR 210 and begin your journey on the Cherohala Skyway by making a right onto TN 165. The best part of this scenic byway through a mountain wilderness is there are no public or private services along the Cherohala Skyway. There are also only three restroom locations along the entire route. Cherohala Skyway brochures are available in either Tellico Plains or Robbinsville, marking the locations for restrooms. Make sure you fill your gas tank, take along extra water and something to eat, you will want to include a midday picnic at one of the many overlook picnic areas. The abundance of overlooks along the way will open your mind to appreciate the wonders of the Blue Ridge and Smoky Mountain’s high country. There are 29 trails along the Cherohala Skyway covering 150 miles. These trails offer long and short hikes to special locations of natural beauty and mystery. There are also 8 horseback trails totaling 31 miles for equestrians to explore from the saddle. Most of the overlooks and picnic area are handicap accessible including one short trail at the very top of the Unicoi Crest, specially designed for mobile chair access. You’ll also find along with the picnic areas and overlooks plenty of kiosks and information plaques with facts about wildlife, wildflowers, plant varieties, trees, the forest, the watershed, mountain balds and hiking trails. There’s also historical information listed about the Native American people and settlers who once lived in and journeyed through these remote mountaintops. These guided informational tours help visitors understand the wealth these mountains have to offer. As the Cherohala Skyway climbs through the thick hardwood forest along the Unicoi Mountain’s western slopes of the Cherokee National Forest, you’ll witness views of mountaintops and hidden coves suddenly coming into view. Below to the west, you can see the Tellico River flowing into the broad Tennessee River Valley and to the northwest the crystal blue waters of Tellico Lake. On a clear day, the Cumberland Mountain Plateau can be visible on the far western horizon. At 4,000 feet above sea level you’ll cross the highest major bridge in the southeastern United States. Along the 700-foot length of the bridge, looking toward the south you will be able to witness a spectacular view of the southeastern Unicoi Mountains and Cherokee National Forest. Sunsets here along the bridge are breathtaking. Just up the road is Beech Gap at 4,490-feet. Beech Gap also marks the Tennessee state line and the end of the Cherokee National Forest. As you continue along the Cherohala Skyway you now enter the Nantahala National Forest of North Carolina, leaving TN 165 behind and beginning your journey on NC 143. NC 143 continues its skyward ascent with each new overlook along the Cherohala Skyway boasting its elevation beginning with the Unicoi Crest at 4,470-feet and Haw Knob at 4,890-feet. When visibility is permitting, the Great Smoky Mountains can be viewed towards the northeast from some of the overlooks along the Unicoi Crest. From Haw Knob, we begin our first step or drive into the mysterious mountain bald country of the Unicoi Mountains. These strange creations of nature tell us we certainly lack the understanding necessary to explain all matter. There are more than 80 of these balds throughout the Blue Ridge and Smoky Mountains. Balds are found on mountain summits and are devoid of the larger trees that grow throughout the Appalachian Mountain Chain. These balds are usually covered with dwarfed trees and shrubs or tundra like grasslands, they are also known as heath balds. Knowledge of their creation is speculative to both geologist and the Native Americans. There are all kinds of tales that refer to this mysterious mountaintop phenomenon. Some explanations are winds of forest fires started by lightening. Others believe that balds were cleared by early Native Americans for ceremonial sites or hunting grounds. It is known that early settlers herded livestock over high mountain gaps, using the tall grass of the bald to feed their livestock along the way. The balds’ resistance to change is contributed to dwarfed trees, shrubs and the grass like tundra which have a deep and tightly bound root system that keeps them producing after their own kind. The balds along the Unicoi Crest follow the Cherohala Skyway eastward beginning at Haw Knob’s 4,890-foot summit, reaching its peak at Santeetlah’s 5,390-foot overlook. You now descend slightly to Hooper Bald’s 5,290-foot overlook before rising to the Huckleberry Overlook’s parking area where the bald continues northward along the crest. These grassland balds crown the mountaintops of the Unicoi Crest, with the lower-slope ridges of dwarfed trees and shrubs connecting the grassy bald crowns like a chain. In 1908 George Moore built a hunting lodge at this bald where he imported into this high mountain range exotic wild game of various woodland and plains types for his hunting preserve. The Huckleberry Bald parking area is at 5,300-feet. It is the next trailhead just up the Skyway on the left side of the road. From this point the Cherohala Skyway begins its eastward descent, but not before we explore the bald above the parking area. The Huckleberry parking area and trailhead has a kiosk with some historical facts and a trail map to the bald about a 1/4-mile from the parking area. This short trail leads up a gradual slope through a thicket of dwarfed trees and shrubs to the bald above. The beautiful overlook from the bald lies in a sea of high grass looking onto the surrounding mountains, coves and deep valleys. This bald has an excellent view of the adjacent Hooper Bald to the south. The hikes to either of these two balds are worth the journey to see for yourself, these natural phenomenons of nature. The very next overlook is Spirit Ridge with an elevation of 4,950-feet. This is by far the best handicap access location along the Cherohala Skyway. The Spirit Ridge Trail is paved and quite level. There are two picnic tables here along this ridge top, each table privately placed under large shade trees. From the picnic and parking area the trail travels straight along a paved nature trail with information signs along the way. A pleasant 3/10 of a mile stroll along this forest lined trail leads to an overlook of the Cherohala Skyway and Slickrock Wilderness Area. The overlook deck has all the proper safety features although over time brush, and growth have crowded the views from the handrail down. Currently visibility can be doubtful for folks with special needs. In the near future, time, budget and permission may allow the forestry service the opportunity and the ability to clear away some of this overgrown brush, so all can see the beauty of these grand mountains whether you’re sitting or standing. Past Spirit Ridge the Cherohala Skyway slowly descends down the mountain slopes with spectacular mountain views at nearly every turn. With each passing mile, the mountainous country of far western North Carolina begins to well around you. Mountain vistas begin to drop with the altitude, White Cove at 4,150-feet, Obadiah 3,740-feet, Shute Cove 3,550-feet, Hooper Cove 3,100-feet and ending at Santeetlah Gap's 2,650 overlook of the Slickrock Wilderness Area and the end of the Cherohala Skyway. Even though the official Cherohala Skyway ends here, this Unicoi Mountain Wilderness road adventure has more great opportunities to come. Just past Santeetlah Gap overlook and within sight of the Cherohala Skyway is Joyce Kilmer Road on the left. If you have time you won’t want to miss the side trip. Only two miles down Joyce Kilmer Road you’ll find Joyce Kilmer Memorial Forest and Slickrock Wilderness Area, a unique treasure of virgin hardwood old-growth forest. This national treasure is one of only a few old-growth forest tree stands left throughout the Appalachian and Blue Ridge Mountains that escaped the logger’s saw. 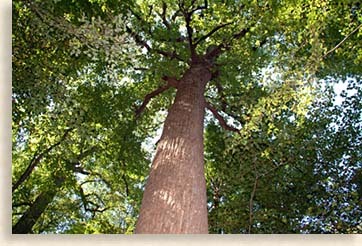 The memorial forest was named after the poet-patriot Joyce Kilmer who authored the popular poem “Trees.” Due to its remote mountainous location, a logging company’s bankruptcy and just plain good luck, these giants of the mountain forest were saved from destruction, preserving their beauty for our enjoyment as well as the generations to come. Some of these great elder trees are well over 100 feet tall, 20 feet around and over 400 years old. A moderate grade, looped trail of nearly 2 miles will lead into the heart of the Joyce Kilmer Memorial Forest where you’ll encounter some of the most ancient life forms in the eastern United States. This 3,800-acre woodland is an awe-inspiring experience that makes the Cherohala Skyway adventure unlike any other. Flowing through the heart of the memorial forest is the Little Santeetlah Creek, which is one of the main watersheds that feed the sky-blue waters of Lake Santeetlah. Lake Santeetlah in Graham County, North Carolina is by far one of the most beautiful lakes in all the North Carolina Mountains, mostly isolated and pristine. After leaving Joyce Kilmer Memorial Forest turn right onto Joyce Kilmer Road, continue 2-miles and turn left onto NC 143. NC 143 winds down the mountain for 12-miles through thick shaded forest, reaching the end of this scenic drive destination at Robbinsville in Graham County, North Carolina. On the western edge of the mountain town of Robbinsville you can round out your journey with a visit to the Chief Junaluska Memorial and Museum located on the right-hand side of the road as you enter town. Chief Junaluska was a great Cherokee Chief and beloved leader of the Snowbird Mountain’s Cherokee People (Snowbird Mountains are part of the Unaka Mountains.) Chief Junaluska is credited for bravery when he and hundreds of other Cherokees fought alongside Andrew Jackson in 1814 at the Battle of Horseshoe Bend along the banks of the Tallapoosa River in Alabama. This battle was against a hostile band of the Creek Nation called the Red Sticks. It is said that Chief Junaluska and several other brave Cherokee warriors committed an act of heroism that changed the tide of the battle in favor of Andrew Jackson and his Cherokee allies. Chief Junaluska considered Andrew Jackson a friend of the Cherokee Nation. Yet when Jackson became president he ignored Cherokee Treaty rights and allowed the expulsion of the Cherokee People from their homelands in the mid 1830’s, a sorrowful event known as the Trail of Tears. After being forced to move to Oklahoma, Chief Junaluska returned several years later to Graham County. Traveling on foot from the plains of Oklahoma, he made his way back to these mountains in order to live out the rest of his life in his beloved homeland. The citizens of Graham County welcomed him back and honored him with 377 acres of land. A nature trail leads from the memorial gravesite featuring indigenous plants and herbs. You can find the Junaluska Museum, Memorial and Nature Trail on Junaluska Drive in Robbinsville North Carolina. It’s time for a well-deserved, break from your scenic road trip to grab a bite to eat and check out the town of Robbinsville before heading back over the Skyway. An overnight stay can be helpful for a fresh start back over the Unicoi Crest. The joining of the two mountain towns of Tellico Plains and Robbinsville has opened many wonderful opportunities to visiting guests. A journey across the Cherohala Skyway is an experience you’ll want to repeat often. We hope you have enjoyed this scenic Blue Ridge Highlander tour and will plan your next scenic road trip on the Cherohala Skyway. Other regional stories and road trips are available by using the links below. Plan your next mountain road tour through the Blue Ridge Highlander….and have a safe journey.